If you will take a look back on the music reviews index page you will see that Richard Bone's CD Coxa was one of the very first CD's to be reviewed here on Ambient Visions way back in 2000 and you know I still look forward to each of Richard's releases to see what he has put his musical genius to work on creating this time around. It is not a huge stretch to say that just about any CD you pick up by this artist will be a worthwhile addition to your music collection. 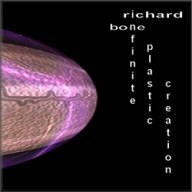 Of course this review is not to sit here and sing the praises of every Richard Bone release but it will point out that he does have a newer release out called Infinite Plastic Creation that came out in 2007 but is definitely worth a review here in the pages of Ambient Visions. Each of Richard's CD's are a separate journey through landscapes both light and dark, bouncy and reflective and yet through it all you will hear Richard's familiar ways of arranging things and instrumentation that brings to mind songs on other of Richard's releases and far be it from sounding like a retread of older music each song is still a unique expression and representation of the composer and his vision for what his music should be as it goes out into the world. The CD consists of 11 tracks that run just over 60 minutes and from what I can tell at Richard's website if you order from there you will receive a bonus 3 track CD-r along with the main CD. I'm sure the songs on the bonus CD-r are also a treat but I did not receive the additional disc with the review copy so I will go with my experience on this one and say that I'm sure it wouldn't be offered to his listeners if the songs on the bonus disc weren't up to his high standards for his regular music releases. This review will focus strictly on the 11 songs from the main disc. While most of the music on this CD does have some sort of rhythm and beat to it I would have to say that the overall feeling of the CD is never to use that beat to do anything other than gently draw you into each of the musical pieces and then bounce around you in a light and joyful kind of way while the rest of the instrumentation washes over you like soft waves on the beach in the summer. Richard's music is at once jazzy, serene, melodic and hypnotic all rolled into one. I can put Richard's CD into my player and set it to repeat and I could find myself still grooving along with it hours later. Of course this CD does have one exception and that would be the last track on the main CD called Indiga, Once Again. On this song Richard gently plays the piano up front while the synths ebb and flow in the background offering a lush palette for Richard's simple keyboard playing in the foreground. No rhythm is needed on this cut and it works very effectively as an ambient piece that allows the listener to kick back as the music wraps around you like a warm blanket on a cold night and lets you drift off into a peaceful state of mind. Perhaps this is just what Richard intended when he wrote the piece and if so he has clearly succeeded. Some of my immediate favorites on this CD are track 2 which is called Elastic Sahara Which is one of those songs that I spoke of at the beginning of this review. It is pure Richard Bone and the minute you play the track the first thought that comes to mind is, That must be a Richard Bone CD in the CD player." It is a very light and airy piece that leaves you tapping your foot to the cool, hip beat and instrumentation. It is also very addictive and leaves you wanting more. Beware, you may have to pull out your old Richard Bone CD's after listening to this track and get a longer fix. And if you don't already have Coxa, Electropica or Ascensionism then perhaps you might want to correct that oversight before listening to this CD. My other two favorite songs are track 5 which is called Toward Amitaf and track 7 called (You Are) Essence of Diamond. Something about the melody that Richard plays on piano at the beginning of track 7 that just sticks in your mind long after the song is over. You know the kind, the ones that you find yourself humming for hours afterwards until the next time you hear the song and the cycle starts all over again. The vocals that kick in a little over the half way mark into the song are great as well. They really punch the song up and adds another layer of interest to the music itself. As for Toward Amitaf I really enjoyed the dark and mysterious feel that the song generates and the drums that dominate this piece have a very tribal feel to them which only adds to the dense atmospheres that surround you while listening. All in all this CD is just what I have come to expect from Richard when he releases a new CD and as usual I was not disappointed by what came out of my speakers. Don't get me wrong when I said that certain tracks were my favorites it is like trying to choose your favorite books from an author whose work you enjoy. I feel the same way about the songs on Infinite Plastic Creation. I like them all and there is nary a weak track in the bunch but the ones I listed above are the standout tracks that make the listening experience that much greater. I'm sure as I listen to the CD again and again I will find others that impress me just as much but for now I'll leave you with those thoughts. As you may have guessed already this one is highly recommended from us here at Ambient Visions and I'm thinking that you will enjoy it as much as we do. Heck why not head on up to Richard's site and do some sampling and see what I mean.